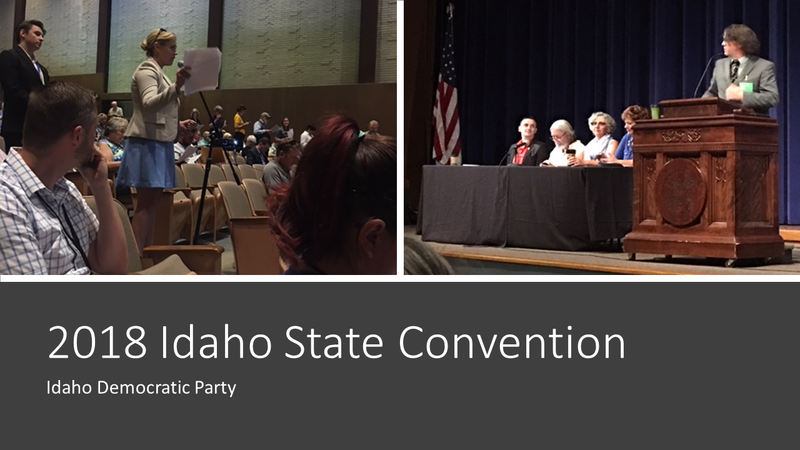 Finally, the 2018 Idaho Democratic Party Annual State Convention is officially over. More importantly, this biennial event, held in Caldwell at the College of Idaho was a big success. The conference drew elected delegates from all over Idaho. Together, this committed group met to develop and approve a state party platform. Kootenai County sent 20 delegates to the convention. Jointly, they represented our local principles in the deliberations. Ultimately, the combined input of the statewide delegates resulted in an exceptional slate of values and beliefs. A platform we all can believe in. Representing Kootenai County on the Platform Committee were Shem Hanks, Lisa Manning, and Harvey Brannigan. Shem is the Chair of the Kootenai County Democrats and Lisa is vice-chair of Precinct 66. Together, these three individuals ably represented Kootenai County during the deliberations. Laboring for many hours on Friday morning, the committee created an initial draft for formal presentation to the delegates. After its presentation to the delegation, there was much discussion on the substance, language, form, organization and grammar of the document. Following the detailed discussion, the platform committee revised the platform again. On Saturday morning, the committee presented a a second draft to the conference. Finally, by late afternoon, the committee presented a finished platform for a vote. With little debate, the full delegatation voted to adopt the 2018 platform as written. One hundred and ninety delegates voted for the platform. Ninety delegates voted against adoption. While some delegates wanted further changes, the general feeling of the assembly was one of euphoria and gratitude. Over all, the platform satisfied delegates as being a comprehensive and bold statement of our values had been achieved. To illustrate, this truly grassroots and small “d” democratic process honored every comment offered by those who participated. Furthermore, it was truly gratifying to see individuals step up to the microphone to express value statements and elaborate on important issues. Overall, the platform committee did a great job of effectively balancing the wishes of the delegates. Most significantly, the official 2018 IDP Platform will serve to inform the public about our party and guide our candidates for public office. Additionally, it can inform our discussions with friends and neighbors. It is a critical component of our messaging, as we make our case to vote Democrat in 2018. Read the full text of the 2018 Idaho Democratic Platform. In addition to developing and adopting the Platform, delegates considered eighteen resolutions. These policy discussions included talk on immigration, minimum wage, the electoral college, and faith-healing exemptions. Other topics included public funding of private and religious schools and legalizing marijuana. To be specific, the marijuana discussion included options for both recreational and medical applications. Medicaid expansion was also discussed among other issues. Read a full list of 2018 resolutions.